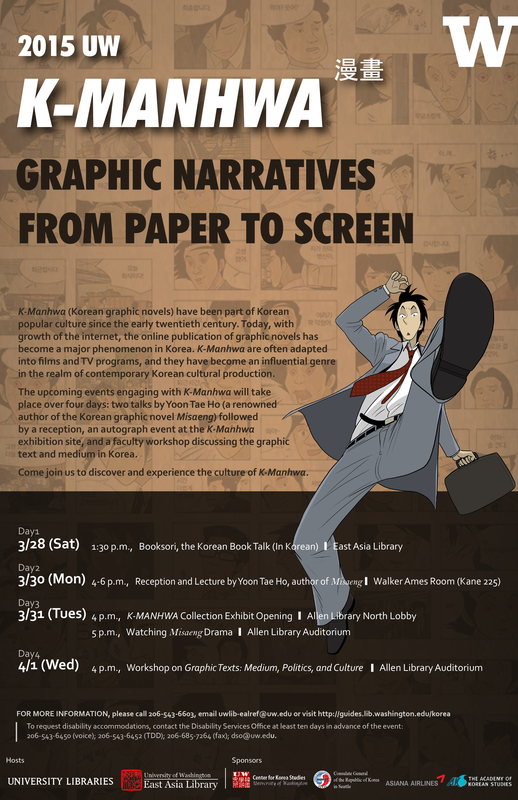 Poster promoting the 2015 K-Manhwa exhibit in Suzzallo Library. K-Manhwa (Korean graphic novels) have been part of Korean popular culture since the early twentieth century. Today, with growth of the internet, the online publication of graphic novels has become a major phenomenon in Korea. K-Manhwa are often adapted into films and TV programs, and they have become an influential genre in the realm of contemporary Korean cultural production. A selection of 1,000 covers have been digitized for online viewing here. The University of Washington East Asia Library has a collection of more than 18,000 volumes published between 1980 and 2004, reflecting a wide range of adult and young adult themes, including mythology, folklore, martial arts, suspense, romance, sports and fantasy. There are also approximately 3,000 popular novels. This is the largest collection outside of Korea. In May of 2013, Hyokyoung Yi, Korean studies librarian at the University of Washington, (in Seattle, Washington) received an unexpected email about a possible donation of over 15,000 volumes of Korean graphic novels, or "Manhwa". Two weeks later, Libraries staff drove to a storage room in Lacey, Washington and packed the Manhwa volumes into boxes, headed for a Libraries storage room at the University of Washington. There, students unpacked and shelved a total of 18,603 volumes on 778 linear feet of shelving. Most of the Manhwa were authored in Korean and a small portion was translated to Korean from Japanese. The collection, published from the 1980s through 2004, reflects a wide range of adult and young adult themes, including mythology, folklore, martial arts, suspense, romance, sports and fantasy. There are also approximately 3,000 popular novels. A finding aid of titles was created over the summer of 2013, and cataloging has begun, allowing UW Libraries users to access much of the collection. The size, depth and breadth of the UW Libraries Manhwa collection, the largest outside of Korea, provides significant support to the study of modern Korean literature and culture at the University of Washington and beyond. A UW faculty member has used volumes from the collection for teaching the Korean language in student classwork. In 2014 Ms. Shine Choi, Korea Foundation Visiting Assistant Professor, Croft Institute of International Studies & Department of Sociology and Anthropology, University of Mississippi, traveled to UW to use the collection for research. Processing of the Manhwa collection is made possible, in part, by awards from the Friends of the University of Washington Libraries and the Center for Korean Studies.